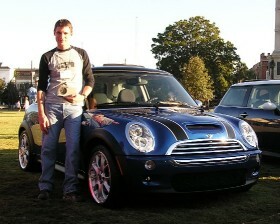 MINI Life in Charleston: R56 Thoughts . . . I agree with your points - all except the exhaust "pop". I think I really like this feature! But only when I'm driving alone. I've had a few passengers comment on it thinking that something was wrong. I like it though when I'm on my own and I can appreciate it as one of Stella's quirks. Does this mean that since the pop apparently came from gas just burning up without being used (like wasted gas, kindof!) that the new engine just doesn't do this anymore? And maybe that's why the fuel economy is better? Hmm. Nice job - although many of your pics are "blown up" and very pixelated, detracting from the articles quality. My biggest issue today is that sticker price issue. Both MCSs I bought were around $25K pleasingly equipped - OK, the GP was $31K but if offer some very special stuff at that price. you forgot the non functional hood scoop. weak!